Humanity can make short work of the oceans’ creatures. In 1741, hungry explorers discovered herds of Steller’s sea cow in the Bering Strait, and in less than thirty years, the amiable beast had been harpooned into extinction. It’s a classic story, but a key fact is often omitted. Bering Island was the last redoubt of a species that had been decimated by hunting and habitat loss years before the explorers set sail. As Callum M. Roberts reveals in The Unnatural History of the Sea, the oceans’ bounty didn’t disappear overnight. While today’s fishing industry is ruthlessly efficient, intense exploitation began not in the modern era, or even with the dawn of industrialization, but in the eleventh century in medieval Europe. Roberts explores this long and colorful history of commercial fishing, taking readers around the world and through the centuries to witness the transformation of the seas. "His impressive book, replete with quotations from the reports of early explorers, merchants and travelers describing seas teeming with life that's unimaginable today, is a vivid reminder of what we've lost and a plea to save what is left and help the sea recover some of its earlier bounty." "[Callum] Roberts's book is invaluable, not to mention deeply disturbing." Jonathan Yardley's 10 best books of the year, "The Washington Post Book World"
"Passionate and immensely important book . . . ."
"Thank you, Callum Roberts, for your riveting, eloquent, compelling and urgently important saga of what may be the greatest environmental tragedy of our time: the relentless, wholesale extraction of ocean wildlife globally. Thank you, too, for inspiring hope that we still have a chance to reverse the disastrous decline of the ocean, and thus secure our own future, as well as that of fish, whales and clams." "Well-documented and objective study of the history of fishing and overfishing since the 11th century...."
"So fascinating, so well-written, so rich with detail…. I couldn't put this book down." "Out of sight, out of mind—the wholesale destruction of marine life under the waves by an increasingly rapacious fishing industry has largely gone unnoticed. This eloquent and inspiring book not only reveals the true extent of this loss but also tells of the oceans' amazing powers of regeneration. A long-time advocate for setting aside large areas of ocean as marine reserves and allowing nature to do her own thing, Professor Roberts makes the case crystal clear as to why politicians and society as a whole must act now if we are to save our oceans and the beauty and the bounty they contain." "The accounts presented in The Unnatural History of the Sea provide compelling comparison benchmarks and expose the harm done by mankind's continued view of wildlife solely as commodity." "The Unnatural History of the Sea is not just another lament over bygone environmental conditions. Roberts highlights the value of conservation efforts, such as marine reserves (areas off-limits to fishing), reminding readers that an awareness of history is essential to designing such programs." "Roberts is eloquent and persuasive as he recounts centuries of ill-managed fishery planning, and allows those who have directly experienced dramatic changes in the oceans to speak for themselves....Thoughtful, inspiring, devastating, and powerful, Roberts' comprehensive, welcoming, and compelling approach to an urgent subject conveys large problems in a succinct and involving manner. Readers won't be able to put it down." "[Roberts] argues that nearly 30 percent of the world's oceans should be set aside as Marine Protected Areas, and his vivid accounts of centuries of relentless harvesting suggest that drastic measures are in order." "Roberts' powerful, almost poetic account of the history of fishing and its deleterious effects on the sea at once alarms and informs." "This eloquent book, rendered with clarity and grace, is a true tale of tragedy. Callum Roberts summarizes the whole sweep of historical time from first European discovery of unimagined living ocean riches to unimaginable depletion and impoverishment of the sea. Yes, there is light at the end of the tunnel. And only by seeing what was can we hope to see what should be, and what must be restored." Carl Safina, author of "Song for the Blue Ocean" and "Voyage of the Turtle"
"Oceans seem vast and untrammeled, but we have wrecked their living resources from offshore to the depths and to the limits of Antarctic ice. Callum Roberts tells this story with passion and elegance, and shows us what we must do to get our marine life back." Chapter 23. Barbequed Jellyfish or Swordfish Steak? 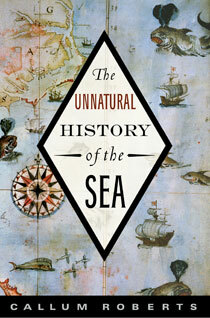 The Unnatural History of the Sea won the Society of Environmental Journalists' 2008 Rachel Carson Environment Book Award and the Independent Publishers Book Awards 2008 gold medal for Best Non-Fiction on Environment/Ecology/Nature.